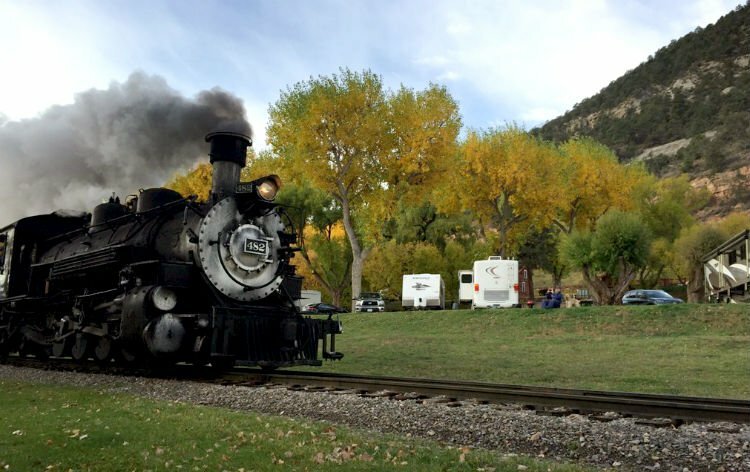 The historic railway has been in continuous operation between Durango and Silverton since 1882. For most RVers it would be shocking to stay at a campground in the mountainous region of Durango, Colorado, to learn that an active rail line runs through it. It would be more alarming to realize that a passing train would blow its whistle multiple times a day. This is exactly what you will find at United Campgrounds of Durango. Nonetheless, I knew all about this before we arrived. Why would we stay at such a park here? The answer is we needed a place to camp for two nights as we wanted to experience the Durango & Silverton Railroad. Plus, we wanted to explore the area. The train leaves daily from its downtown core. What better place to camp than along the tracks of a historic railroad. In fact, the historic railway has been in continuous operation between Durango and Silverton since 1882. The extensive round trip leads through the dense San Juan National Forest, which is a National Historic Landmark and a Historic Civil Engineering Landmark. There are also a series of special excursions/themed trips along the way throughout the year. What’s more is adventurous RVers should stay a few extra days to explore the Colorado trails of this southwest region that includes Durango, Silverton, and many other areas. United Campgrounds of Durango is the closest RV park to the train depot. This is a benefit given the early departure times of most excursions. Additionally, there are great photo opportunities of the train. The full-service RV park itself offers 100-plus level sites, 90 grassy tent sites, and generous pull-through spaces. Large shade trees are also among the grounds. Additionally, the pet-friendly park has a store/gift shop and a heated swimming pool. The restrooms are also clean and offer hot showers. If you don’t feel like driving your tow vehicle, dinghy or motorhome to the train depot, a trolley departs several times hourly from a trolley stop conveniently located just in front of the park. Having a steam locomotive rumble through your campsite, just another adventure in RVing!